The progenitor of both the Yeovil and Weymouth branches of the Penny family (spelt variously through time as Pen, Penn, Pene, Penne, Peny, Penny, Penney, Penye, Pennye, and so on) was Nicholas Penny of Yeovil. 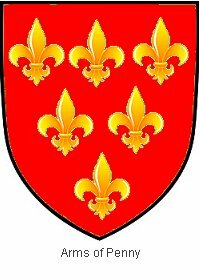 He inherited the advowson of West Coker and bore the Arms granted to the family in the 16th century. He had at least two sons; Nicholas Penny of Bruton who married Alice Plumley there in 1574, and Richard Penney of Yeovil. Richard Penney was a tailor of Yeovil and married to Frances. They had at least six children; Roger, Richard, John, Onesiphorus, Edith and Frances. In his will of 1620 (see below) Richard named his father, leaving him his two best shirts, and his brother to whom he left his two best handkerchiefs and two decorated with silk. He left his children £10 each (around £60,000 at today's value) and the rest of his estate to his wife, Frances. Richard died in Yeovil in 1620 and after his death Frances moved to Weymouth with the children, all of whom were minors. Roger, the eldest son, died in 1645 and Frances died in Weymouth in 1650. In her will she named her three living sons; John, Richard and Onesiphorus, as well as her four married daughters. The fourth son, Onesiphorus Penney, carried on the family succession. He was a Maltster and lived in Yeovil. He had business interests in both Yeovil and Weymouth and held land in both places. Onesiphorus and his wife Florence had at least five sons and three daughters; John, Onesiphorus, Richard, Sarah, Henry (1649-1721), Samuel, Mary and Martha. In his will of 1665 (see below) Onesiphorus left most of the Weymouth and Melcombe Regis properties to his eldest son John, with some to his son Richard, and the Yeovil properties to his fourth son Henry. To return to Onesiphorus - he died in Yeovil in 1668 - leaving his dwellinghouse, malt-houses, stables, garden, etc. as well as the southern half of his orchard to his son Onesiphorus Jnr. His daughter Sarah was left the northern end of the orchard with its barn, as well as an acre of land at Hayes End in Yeovil. He left the sale of a seven acre Yeovil field called Chedd's Close to his other four children and the remainder of his estate to his wife Florence. One of Onesiphorus' sons, Henry Penny, carried on the Yeovil succession. He was born in 1649 and came to be described as a 'Gentleman' of Yeovil. Little is known of him but he married and had three sons and five daughters. He was recorded in the 1689 Poor Rate when he was charged 7d "for Starrs". He was recorded again in 1729 when his house was taxed six shillings (the Window Tax) for having between 10 and 20 windows. His eldest son, Onesiphorus, was a Churchwarden of St John's church between 1723 and 1725 and was also Portreeve of Yeovil in 1733 but died in 1735 in Yeovil. Onesiphorus was also taxed six shillings for his house in the Window Tax. Another son, Henry Penny Jnr, was born in Yeovil in 1691 and was a Glover or Glove Manufacturer of Yeovil. He was also involved in brickmaking and tile making. In 1713 he married Elizabeth Boone of Crewkerne. They had at least two sons; Onesiphorus (1713-1765) and Boone (1716-1765). Onesiphorus became a Churchwarden, succeeding his brother in 1726 and 1727. He also became Portreeve of Yeovil in 1735, the year of his older brother's death. Elizabeth died and Henry remarried, to Mary. It would appear from his will of 1742 (see below) that Henry was very wealthy. He left several houses in Yeovil (including some at Montacute as well as tracts of land in Yeovil to his son Boon but the bulk of his estate passed to his eldest son Onesiphorus. In his will he left legacies totalling £990 (about £2.75 million at today's value) in addition to all his properties and lands and, presumably, the bulk of his cash that was left to Boon and Onesiphorus. It is known that the Rose & Crown Inn in the Borough was owned by Onesiphorus then, presumably on his death, passed briefly to Boon. Henry Penny died in 1742 and both his sons died in 1765. When Mary died in 1775 she left all her inheritance to her own extended family and nothing to the children of her stepson Boon Penny. Of the two sons of Henry Penny, Onesiphorus was baptised in Yeovil in 1713. He was a 'Haberdasher of Hats' of Yeovil - charging thirteen shillings for a gentleman's hat in 1732 and fourteen shillings in 1734 and nine shillings for a servant's hat. Onesiphorus was a trustee to his cousin, Thomas Penny the Receiver General of Somerset who purchased on 9 March 1722 "the manor or reputed manor, capital messuage, Barton Farm and demesne lands of Brympton; and the advowson of the church of Brympton; and the manor of Alvington, and all other manors and hereditaments of the said Philip Sydenham, in or near Brympton, Alvington, West Coker, Odcombe and Tintinhull, or any of them" for the sum of £15,492 10s 0d (around £45 million at today's value). In the Poor Rate of 1760 Onesiphorus was rated 2s 0¾d. Onesiphorus married but died childless in 1765. The second son of Henry Penny, Boon or Boone, was baptised in Yeovil in 1716. He married Anne (1723-1776) and carried on the Yeovil succession. Boon and Anne had two sons, Henry and Thomas, and a daughter whose name is unknown. Little is known of Boon although he had business interests in Yeovil, including ownership of the Rose & Crown Inn in the Borough. However an indenture of 1743 refers to him as a 'Clothyer'. He was a Churchwarden of St John's church in 1749 and 1750. He was in the Royal Navy and died on Foreign Service in 1765. Boon and Anne's eldest son, Henry Penny, carried on the Yeovil succession. He was baptised at Yeovil in 1746. Henry became a wealthy Glove Manufacturer and married Drusilla Chalkley (1746-1822). In his early career he moved to London and had two children there (although both died in infancy) before returning to Yeovil where two more children, Henry (1778-1855) and Elizabeth, were born. Whether or not his marriage to Drusilla ended in divorce is not clear but in his will of 1796 (see below) in reference to a bond he refers to her as "Drusilla therein called my wife late Drusilla Chalkley" but later refers to "Margaret whom I likewise call my Wife late Margaret Sweetman Spinster". Both Drusilla and Margaret were mentioned in his will; Drusilla, already with a bond of thirty pounds a year for life, received ten pounds while Margaret received five hundred pounds and his daughter Elizabeth received one thousand pounds (worth around £1.5 million at today's value). Margaret had the use of the house in Higher Kingston and all the household goods - but only for three months after Henry's death. Everything else went to Henry's only son, Henry Jnr. Henry Penny Jnr (1778-1855) became a Glove Manufacturer, Banker, Land Owner, Town Commissioner and Special Commissioner. He has his own page - click here. In the name of God amen the Fifth Day of December Anno Domini one thousand six hundred and twentie I Richard Penney of Yevell in the Countie of Somerset taylor sicke of bodie but of good and perfect memorye god be praysed Doe make and ordayne this my last will and Testament in manner & forme folowing that is to saye First I commend my Soule unto the handes of god my maker hoping assuredlie throughe the only meritte of Jesus Christe my Savyer to be made partaker of life everlasting: It(e)m I Commend my bodye to be buryed in ye parishe Churche or Church yarde of Yevell aforesayed. Item I give and bequeathe to the Churche of Yevell twelve pence. Item I give and bequeathe to my Daughter Edith tenne poundes to be payed her when she cometh to the age of one and twentye yeares. Item I give and bequeathe to my Sonne Roger tenne poundes to be payed hym when he accomplish the age of one and twentie yeres. Item I give and bequeath unto my Daughter Frannces Tenne poundes to be payed her when she commeth to the age of one and twentie yeres. Item I give and bequeathe to my Sonne John tenne poundes (inserted = to be payd him) when he commeth to the age of one and twentie yeres. Item I give and bequeath to my Sonne Richard to be payed hym when he commeth to the age of one and twentie yeres. Item I give and bequeath to my Sonne Onesepperus to be payed hym when he commeth to the age of one and twentie yeres. And yf yt shall fortune any of my Sayed Children to dye before he or she accomplish the age of one and twentie yeres Then I will that his or her portion to (word illegible) shall remayne to the other of his (inserted = or her) brethren and Sisters surviving and not then marryed Equallie to be Divided betwene them. Item I give unto my Father Nicholas Penney twoe of my best shirtes. Item I give to John Bradley my best hatband and my best wearing Ruffe band and twoe Silke poynted (words illegible) to tye the same band with: Item I give to my Brother Nicholas Penney my twoe best handkerchers and twoe Silke poynted. All my other goods moveable and unmoveable not before given and bequeathed I give and bequeathe to Frannces my wife whom I make and ordayne my whole and sole Executrix of this my last will and testatment: And I make and ordayne my Brother in Lawe Thomas Wallis and John Bradley Overseers thereof. I(te)m I give & bequeathe to eache of them for theire paynes twelve pence. In Witnesse whereof I have hereunto set my hand and seale the Daye and yere first above written. Signum Richard Penney. Signed and Sealed in the presence of George Hacker John Hull Giles Gillett Signum Willm Hopkyns. In The name of God Amen I Onesphorus Penney of Yeovell in the County of Somersett Maultster being sicke of body but of perfect mind and memory (thanks be to Almighty God) Doe make this my last will and Testament in manner and forme following (That is to say) First I bequeath my soule into the hands of Almighty God hopeing that through the (word illegible) death and passion of Jesus Christ my only Saviour and Redeemer do have Free remission from all my Sinnes And for my world Estate I bequeath the same as followeth First I doe hereby give and bequeath unto my Sonne Richard Penney Five Shillings of Lawfull money of English to be paid unto him By my Executrix hereof Item I doe hereby give and bequeath unto my Sonne John Penney his Executors Adminsitrators and assigns All that my dwellinghouse welhouse with the Garden Plot (word illegible) appurten(anc)es thereunto belonging or apperteyning situate lying and being in Melcombe Regis and Weymouth in the County of Dorsett imediatly from and after the death of my brother John Penney for and during all my terme of yeares and estate therein which said house and premisses are now in the tenure of the said John Penney my brother and of one Davis his undertenant But in case my said Sonne John Penney shall dye before he be married Then in such case I doe hereby give and bequeath that said house and premisses aforesaid And all my Estate and terme of yeares therein unto such and soe many of my Children who shall at the tyme of the said decease of my said Sonne John Penney (being soe unmarried) shalbe then alive and unmarried Item I doe hereby give and bequeath unto my Sonne Onesephorus Penny and the heires of his body lawfully to be begotten All that my Dwellinghouse Malthouses Stable garden outlett And the one halfe of my orchard thereto belonging Southward in the parish of Yeovell aforesaid But in case my said sonne Onesephorus shall happen to dye before he be married Then in such case I doe hereby give and bequeath my said house and other the said last devised and mentioned premisses unto such and for many of my other children who shalbe then alive and unmarried But in case my said Children shalbe then all dead and married Then I doe hereby give and bequeath the same unto my said Sonne Richard and his heires for ever Item I doe hereby give and bequeath unto my Daughter Sarah Penney and the heires on her body lawfully to be begotten the other halfe of my said Orchard Northward and my barne at the end thereof And all that my Acre of land lyeing att a place called Hayes End all which last mentioned premisses are situate lyeing and being in the parish of Yeovell aforesaid But in case shee the said Sarah shall happen to dye unmarried Then I doe hereby give and bequeath the same half mentioned and devised premisses unto such and soe many of my Children who shalbe then alive and unmarried But in case my said Children shalbe all Dead and married Then I doe hereby give and bequeath unto my Sonne Henry and his heires for ever my Said North part or end of my said orchard And my said barne att the end thereof And alsoe in such case I doe hereby give and bequeath unto my Sonne Samuell Penney and his heires for ever my said Acre of Arrable land att Hayes-end aforesaid Item I doe hereby give and bequeath unto my (word illegible) friends Giles Hayne of Yeovell aforesaid Grocer and Lawrence Wills of Yeovell aforesaid Gardener and to the Survivor of them their heires and assigns for ever All that my close of Pasture called Chedds close (lately Marled) conteyning by estimation Seaven Acres be the same more or lesse situate lyeing and being in the parish of Yeovell aforesaid Part whereof I purchased of Mathew Cox And the other part or residue thereof of and from Richard Chedd Glover In trust neverthelesse That the said Giles Hayne and Lawrence Wills or the survivor of them and their heires shall and may within the space of Seaven yeares next after my decease sell and dispose of the same these and premises with its appurtenn(anc)es unto some person or persons his or their heires and assignes for ever for such summe or summes of money consideration or considerations as they the said Gyles Hayne and Lawrence Wills or the survivor of them or their heires shall in their or his discretion or discretions shall think fitt And I doe hereby will and appoint that the moneyes thereof raised shall (reinsure ?) and be and I doe hereby give and bequeath the same unto my Children Henry Penney Mary Penney Martha Penney and Samuell Penney equally to be divided and paid to and between my said Four Children last named att their severall and respective ages of one and Twenty years And of the interest money thereof raysed To be paid and tielded unto my Loving wife Florence Penney But if any of my said Four Children last above named shall happen to dye before they he or she shall attain his her or their respective age or ages of one and Twenty yeares Then I doe hereby will and appoint that the part or portion of him her or them Soe dying shalbe and remaine to him her or them my saif Four children last above named surviving Item I doe hereby give and bequeath unto my Said Sonne Richard Penney All my goods and household stuffe which are in severall houses situate lyeing and being in Weymouth and Melcombe Regis in the County of Dorsett now in the possession of my under tennants there Item I doe hereby give unto my said sonne Richard my silver Salt my best Table cloth and Twelve Table Napkins thereto belonging and my Brasse panne Item I doe hereby give unto my Sonne John Penny Five shillings All the rest of my goods and chattells not herein or hereby before given and bequeathed I doe hereby give and bequeath the same unto my said Loving wife Florence Penney whom I doe hereby make constitute appoint and declare whole and sole Executrix of this my last will and Testament And I doe hereby make constitute and desire the said Giles hayne and lawrence Wills my overseers of this my last will and Testament And doe hereby request them to see it performed In witnes whereof I have hereto sett my hand and seale this last day of January in the Eighteenth yeare of the Reigne of our Soveraigne Lord King Charles the Second of England Anno Domini 1665. One(siphorus) Penney. Sealed delivered Published and declared in the presence of us William Sugg John Grubham Walt Toy.